With its quaint 19th-century setting, four memorable heroines (five if you count Marmee), and its emphasis on the importance of family and togetherness in both good times and bad, Louisa May Alcott’s beloved semi-autobiographical novel Little Women, spanning almost a decade during and after the American Civil War, is both an obvious and daunting choice for adaptation to the stage. Obvious, of course, due to the sheer vitality and festive beauty of the March sisters (bedecked as they are in ribbons and lace, even as they stage blood and guts operas in their attic), and the palpable love and loyalty they feel for one another. 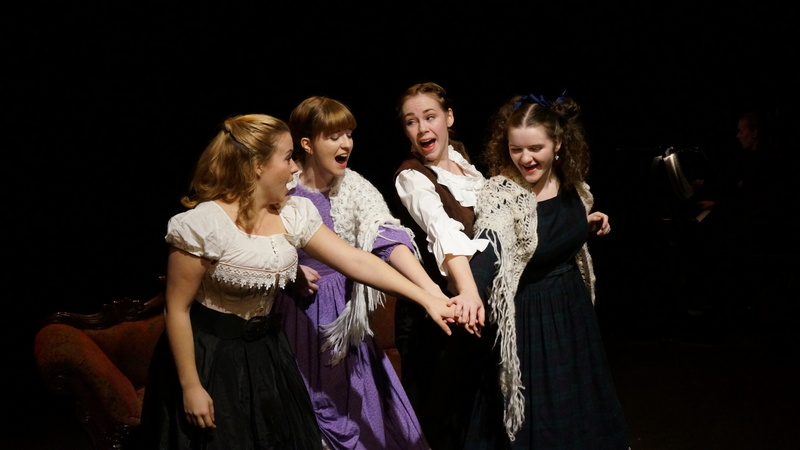 In Fighting Chance Productions‘ first holiday show, Little Women The Musical (music by Jason Howland, lyrics by Mindi Dickstein, and book by Allan Knee), the theme of love and loyalty takes centre stage. As the play opens, the adult Josephine March dreams of literary fame but receives only rejection letters from publishers. Dejected in a New York City boarding house, she realizes she was never so brilliant as she was back at home in Concord, Massachusetts, penning lurid tales of adventure and passion for the amusement of her sisters. It is at this moment that we find ourselves in Orchard House, the home of the March family, many Christmases ago, and it is here that Alcott fans will find their footing. The impetuous Jo cuts down snobbish Mr. Laurence’s Douglas fir, sweet Beth decides to give it to the poor family down the road for a Christmas tree, little Amy complains about the shape of her nose, the romantic Meg hopes to be invited to Annie Moffat’s Valentine’s Day ball, and Marmee is tasked with enveloping all four of her daughters in love and stability while her husband is away at war. The musical adaptation of Alcott’s text is concerned primarily with Jo’s story, and performer Julie Casselman is equal to the task of leading her intrepid band of sisters through the highs and lows of their years together. The March sisters–Meg, Jo, Beth, and Amy (Robin Eder-Warren, Casselman, Danielle Melvin, and Roan Shankaruk respectively) whirl around the stage in a flurry of ringlets and flying skirts, their beautiful voices singing in harmony like a chorus of angels, and their highly choreographed blocking creating elegant stage pictures worthy of a Christmas card. Ambitious, high-strung, and fiercely devoted to her family, Jo struggles to come to terms with growing up–and with letting the people she loves do the same. While she relies on them to support her in her dreams, she learns that loving her sisters means accepting that they will sometimes leave her–to get married, to travel Europe, or, in the case of the shy and quiet Beth, to finally give in to the spectre of illness that had been slowly sapping her strength. Unfortunately, Little Women The Musical‘s focus on Jo means many plot points that don’t include her are left out–Meg, Amy, and Laurie, for example, are not given the benefit of the character development we see in the book, and while Meg does eventually become more mature through marriage and motherhood, we leave Amy just as silly at the end of the play as she was at the beginning. Both the adaptation and this production are highly presentational, and I wanted more moments of subtlety and quiet intimacy to balance out the bombast and musical pomp. Having a pianist and violinist on stage were an incredibly nice touch, but in the relatively small playing space some of the lyrics were occasionally drowned out, and the production may have benefited from more physical distance between the musicians and players. That being said, Little Women the Musical still has plenty of heart. A particularly sweet and surprising duet between Beth and the curmudgeonly Mr. Laurence (Peter Stainton) stands out, and I saw more than one person wiping their eyes as Beth and Jo said their good-byes to each other (as for me, I was a sniffling mess). The love duet between Meg and Mr. Brooke (Mark Kroeker) is quietly romantic, and Jo’s closing solo in Act I (“Astonishing”) paints a strong picture of a dauntless young woman’s determination to succeed. A refreshing departure from more thoroughly Christmas-based holiday productions, Fighting Chance’s Little Women The Musical, with its flouncing dresses, musical frolics, and story of love is an entertaining introduction to Alcott’s classic. I know if I had seen the production as a child I would have been absolutely in love with it. Little Women The Musical runs at Studio 1398 on Granville Island until December 21. Tickets can be purchased online through Tickets Tonight. Disclosure: I attended Sunday’s performance of Little Women The Musical courtesy of Fighting Chance Productions.